Have you ever thought about something so hard that it made your brain hurt? I love doing that. Thinking about things that are so great and so hard to comprehend. 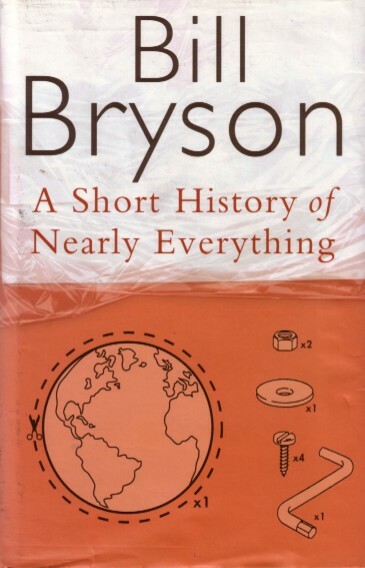 I started Bill Bryson’s “A Short History of Nearly Everything” last night and (If you haven’t read any Bill Bryson books, you’re pretty much wasting your life.) it made me think about how fleeting life is. He mentions how a human life is about 650,000 hours long. That doesn’t seem like that many hours, does it!?!? I thought I had more time than that. The other night I was literally wowing myself thinking about how crazy it is that I’m a human being. I know it sounds super dumb. That’s one of the first things we learn when we’re little–I am a person. But really, think of all the other living things you could have been born as. I think everything has a spirit. I could have been born as a cat. But instead I’m able to think, have opinions, get dressed, laugh, make blog posts. I mean, it’s endless the things that we are able to do. Bill Bryson mentioned how we were all made up of atoms. Doesn’t that freak you out? It makes me want to huddle in the corner of the room and rock back and forth. Everything is made of atoms. Why do we know that? HOW do we know that? You can’t see atoms. How are humans so smart? Not only have you been lucky enough to be attached since time immemorial to a favored evolutionary line, but you have also been extremely–make that miraculously–fortunate in your personal ancestry. Consider the fact that for 3.8 billion years, a period of time older than the Earth’s mountains and rivers and oceans, every one of your forebears on both sides has been attractive enough to find a mate, healthy enough to reproduce, and sufficiently blessed by fate and circumstances to live long enough to do so. Not one of your pertinent ancestors was squashed, devoured, drowned, starved, stranded, stuck fast, untimely wounded, or otherwise deflected from its life’s quest of delivering a tiny charge of genetic material to the right partner at the right moment in order to perpetuate the only possible sequence of hereditary combinations that could result–eventually, astoundingly, and all too briefly–in you. It’s crazy to think about. I’m sure some people are like, yeah yeah, everyone on this planet is human–it’s not that crazy. BUT IT IS. Have you ever been inside a Cathedral and marveled at it’s grandeur? Or been to a museum and stood in awe of brilliant works of art? It’s kind of amazing how things like that can make you feel so small. I remember feeling that way when I was in Venice right after I exited St. Mark’s Basilica. I can recall thinking, I’m in a city that’s floating on the water. WHAT IS LIFE?! I browse online for cool stuff all the time. 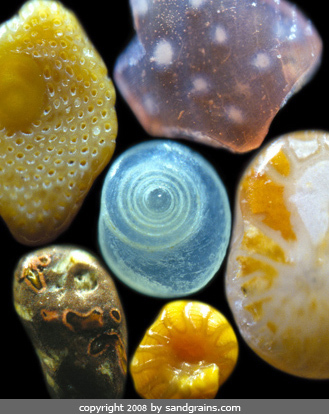 I’ve come across some truly wonderful discoveries, like this: Sand under a microscope. When I first saw this, I almost cried. How have we been walking around, not knowing the beauty that was beneath our feet? It’s almost like it’s a joke. Everyone hates sand, but they don’t know how beautiful it really is. I know I sound super cheesy, but just look at it! 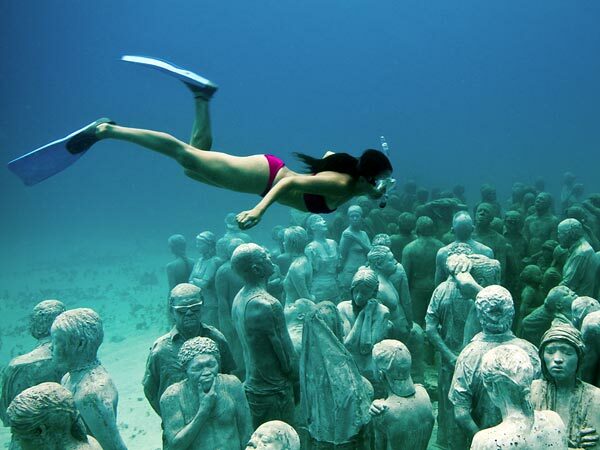 I was also wowed by this: Jason deCaires Taylor’s Underwater Sculptures. 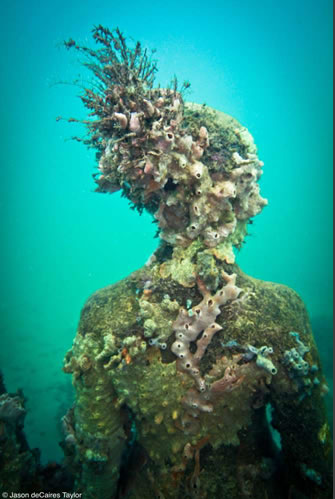 He took sculptures to a whole new level. By allowing sea life to grow on them, adding color, and making his work even more beautiful and pure. Let’s be real, sculpting is one of the most difficult forms of art. My brain literally hurts when I think of artists chiseling away at what would be the material draped across a statue’s body. Taylor’s work adds another element. To see his work, you have to go beneath the surface. Imagine how quiet it is when you’re viewing them. Such an original and amazing idea. And lastly, just consider our universe for a minute. Astronomer Geoffrey Marcy said, “They’re all on the same plane. They’re all going around in the same direction…It’s perfect you know. It’s gorgeous. It’s almost uncanny.” while describing the solar system. It’s too perfect to be just “a coincidence”. Did you know that there are as many stars as their are grains of sand? Just let that sink in for a minute. Did you also know that the light from stars that we see every night is thousands of years old and all of those stars are already gone? Mind blown. I think you oughta get freshly pressed for this post! Seriously. This was AMAZING. I feel smarter for having read it! I love to discover crazy mind blowing facts like the ones you’ve presented. It’s NOT cheesy, it’s super cool. Anyone who says differently is a dolt. I tried with my little pea brain. Tonight think about your name. Think about Lily and who she is, what she represents. I do that with myself sometimes. We spend so much time kind of looking at our lives from outside ourselves (at least I do) that sometimes I forget all of this stuff is happening to me. Anyone who can’t relate to this is pretty weakminded and selfish. Good read! You also made the sand in my belly button seem beautiful. Aww that’s kind. Thanks lil’ moosey. I’ll definitely think about that. It’s so true. I always interrupt myself when I’m thinking about me as a person, I think about how dumb I am. But I guess I’m pretty special. We all are, right? Thanks for reading! Glad you liked it so much! I often sit around and think about how lucky I am just to have been born in the United States. Why not Africa or China? Not that those are bad places, just not like this one. Right? I’ve thought about that too. What did we do to deserve such comfy lives? Probably not a lot. Crazy to think about. Amazing perspective to examine and to turn towards all of us so we may do the same. Thank you for the insight, Lily. It is appreciated. Aww thanks Addie. That’s really nice. Glad you liked it and got a lot out of it! I too wonder about all of these things, it’s amazing to think that time actually is relative, we’re seeing light that has taken so long to get to us, while most of them are already gone, they’ll be in our sky for many years to come. What amazes me more is our own history, it’s mind boggling to think that before I existed wars were fought, so many billions of people have died and they are all somewhere on this planet – buried and how it was all recorded for us to learn about now and how life will go on when we ourselves are dead. Everything that goes on now will be nothing but a few sentences in a history text book in a few hundred years, what will they consider great literary pieces of work? What will be the next evolutionary step in humanity?! I sometimes hope death isn’t the end so I can observe for the end of time. Awww thanks lil’ Petey! The star thing freaks me out as well. How can that be? It’s crazy to imagine. I read that book a while ago actually, it’s very good. Yeah it’s definitely a good read. Science was never my best subject, but he talks about it in a way that it’s easy to understand. I like! Bill Bryson has a way with words doesn’t he. Really good post Lily. He really does! Thanks for reading it! Glad you liked it! How have I never seen sand under a microscope?! I live in the freaking Bahamas! That is INSANE! Thanks for sharing all that cool info, and the awesome pictures. So glad you liked it! I know! Sand is like my new favorite thing! I’m still so jealous that you live in the Bahamas! Let’s trade lives, okay? Wonderful thing to have your mind blown every so often. Funny thing is that from where we sit now, all that amazes you, couldn’t have happened any other way. And now my mind is blown. Again. So true! Ahh it’s so weird to analyze every situation and how we got to where we are today. Crazy, right? Glad you like getting your mind blown as much as I do. Thanks for reading and enjoying! Oh boy I am super glad that you enjoyed it! The book is actually kind of challenging for me because he talks about a lot of sciencey things that I don’t really understand, but I’m sure you’d like it. He can’t do any wrong, really. I could look at the sand and sculptures all day long! It makes me think, what other cool things am I missing out on?! Don’t hurt your brain, Lily! Its one of your best features! Well gee, thanks! I’ll try not to marvel as much! Awww, Lils, I LOVED this. The world is an amazing place. I hate to constantly be talking about babies and stuff, but sometimes I look at my kid and am like OH MY GOD I CREATED YOU WITH THE PERSON I LOVE. It blows my mind every single time that she exists on this planet hurtling through space, and that we are all here together. The world is so amazing and we all need to just slow down and look at it (and read some Carl Sagan hehehehe).